What is the relationship between general practitioners (GPs) and hospital consultants in the United Kingdom?How does government health policy impact upon GPs and hospital consultants?What influence does the medical profession have upon policy makers in the United Kingdom? The medical profession occupies a dominant position within the British health care system and as such is able to influence the development and implementation of health policy. The main division within the medical profession lies between general practitioners and hospital consultants. This book provides a comprehensive analysis of British health policy over the past twenty-five years. Drawing on data from case studies, it provides empirical evidence of the impact of recent health policies upon the National Health Service (in general) and the medical profession (in particular). The case studies provide an analysis of the impact of the 1991 NHS reforms, as well as examining the ongoing influence of the post 1999 NHS reforms upon these intraprofessional relations. What emerges is that the relationship between GPs and hospital consultants is transforming from a collegial to a more managerial relationship. 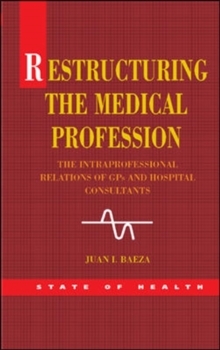 This book sheds light on the resulting development of intraprofessional relations between GPs and hospital consultants within the NHS.Restructuring the Medical Profession is key reading for undergraduate and postgraduate students, researchers and professionals in the fields of social policy and health policy. It is also of interest to health service practitioners, health service researchers and health policy makers.